The comeback kids are alive and well, with an extra dose of déjà vu on the side. Facing an early 2-0 deficit, the No. 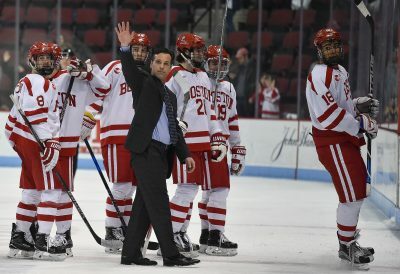 8 Boston University men’s hockey team never said die on Saturday night, completing the sweep of Northeastern University in the Hockey East Tournament’s quarterfinal round. With a 3-2 win in hand – a repeat scoreline from Friday night’s series opener – the Terriers advance to the semifinals next weekend at TD Garden. Above all else, even when matters again looked bleak, Quinn’s side dug deep and found a way to get the job done. Only this time around, their great escape came with an extra caveat: It virtually guaranteed the Huskies’ (18-15-5) dream of postseason silverware comes to a screeching halt. Northeastern, which captured the 2016 Hockey East Tournament, came into the weekend on an 11-3 roll, only to meet their maker. Head coach Jim Madigan’s squad came out with desperation, and their tempo paid dividends just 2:23 in. Forward Biagio Lerario beat freshman goaltender Jake Oettinger bar down, only for Nolan Stevens to cushion the lead nearly 10 minutes later immediately after a power play expired. 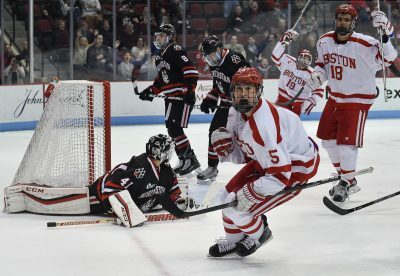 Feelings of déjà vu crept into Agganis Arena, but freshman defenseman Chad Krys said the sputtering start was the product of BU’s recent 13-day break in between games. Then, with nearly five minutes left in the second frame, the Terriers sparked to life. While on the power play, freshman winger Clayton Keller picked out sophomore center Jakob Forsbacka Karlsson, who tipped the puck home past goaltender Ryan Ruck. 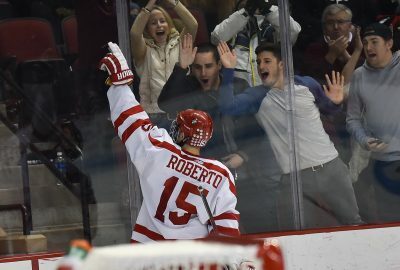 Trailing 2-1, senior forward Nick Roberto found the equalizer early in the third period, and then a golden chance fell into BU’s lap. Northeastern defenseman Garret Cockerill was called for hooking with 1:34 left in the contest, and Krys ensured that another overtime encounter wasn’t in the cards. The 6-foot native of Connecticut pounced on a “JFK” rebound, slotting into the open net with 24.9 ticks remaining. And just like that, what seemed like a season-saving win for Northeastern turned into a drama-filled “W” for the home side. 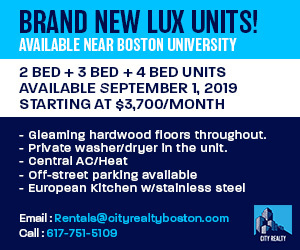 Looking down the road, the charge before BU doesn’t get any easier. Early signs indicate it’ll play No. 17 Boston College next weekend in the Hockey East semifinals, but no matchups are yet written in stone. Regardless of who the opponent is, though, Quinn and Somerby said there’s reason for equal parts optimism and reflection. Come that point, Somerby said instinct will take over.